Majority of the auctioning organizations are not involved in manufacturing the products. Their business is mainly concerned with purchasing and selling of products. It means they have to manage stocks, purchase orders, sales orders, reports, vendors etc. regularly. It also means their business rely a lot on inventory management. Auctioning organizations add stocks detail in GOIS Pro, which they buy from vendors, and sell to their customers. They raise purchase orders and send those orders to vendors for buying stocks. After that, vendors deliver stocks into the warehouses. Lastly, they punch sales orders for their customers. After dispatching sales orders, GOIS Pro automatically deducts items from stocks, which were mentioned in the orders. How does GOIS Pro help in setting the base price of a product for auctioning? Quality is one of the major factors which is used in setting the base price of a product in the bidding process. It is mainly measured by looking at the manufacturing date of a product. In GOIS Pro, users can add the manufacturing date in the description field available in stocks management, and use it in the bidding process for setting the base price of a product. 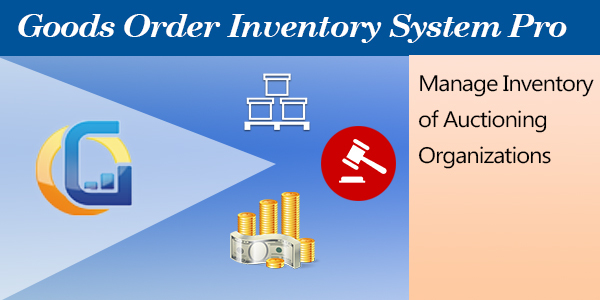 Auctioning organizations can generate profit/loss reports, and they can also track the amount which they have to pay to vendors from closed purchase order section. Also, sometimes, some auctioning organizations have to repair the products before auctioning. For that, they need to buy spare parts from vendors and manage the inventory. In GOIS Pro, they can also manage the inventory of spare parts, in the same way that they do for auctioning products.